Mushrooms, Stir-Fry Mix, Dry have a good shelf-life, which allows them to available whenever we want to add them to a stir-fry or soup. 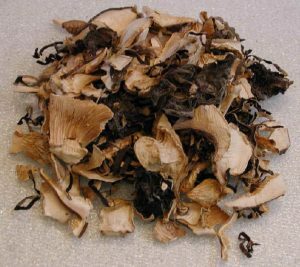 As the name implies, these dry mushrooms are blended together to add a special treat to stir-fries. They are also great in soups. We purchase this mushroom mix from the co-op (D’Allasandro) in one pound packages because of their convenience and storability. This blend has a wide range of tastes and textures, which adds interest to the soups and stir-fries.We could not find any detailed nutritional information for this product.